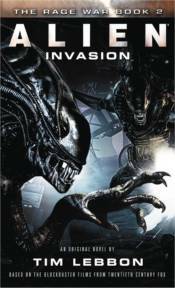 The second novel in the Alien vs Predator 'Rage War' series. Across a sector of the Outer Rim, Colonial Marines units are being wiped out - and not by the Predators. This is an attack by organized armies of Aliens. Dropped onto planets and habitats, the Xenomorphs spread like a plague. The Colonial Marines, including Akoko Halley and the 39th Spaceborne, retaliate and seek a way to destroy the invaders sent by the Rage. At the same time the android Liliya, who fled the Rage, travels with a Predator who is becoming more insane by the day. Their pursuers are relentless, determined not to let Liliya fall into human hands. As the fight moves deeper into the Human Sphere, it becomes clear that the assault on the Sol System is imminent, and the ultimate target is Earth.